Solid Waste Management by Organic Way!!! Modular treatment plants are waste and wastewater treatment plants that are pre-fabricated, self-contained, turn-key and transportable. New concepts of nano-technology enable our coating to mimic one of the most amazing properties in nature, extreme water-repellency on the lotus leaf, in your products. The ANAMMOX® (anaerobic ammonium oxidation) process is an innovative biological process that represents a major breakthrough in nitrogen removal. It is a cost effective, robust and sustainable way of removing ammonium from wastewater and from waste gas. M/s Prithvi Eco Sciences (P) Ltd is a biotech company with a strong focal point on enzyme production. The company is committed to be the front-runner in implementing a very unique and comprehensive methodology for amalgamated waste treatment. The technology developed, tried and tested by the company is very robust, yet eco-friendly and to a large extent, go well with sub-continent conditions and the lifestyle of this society. The company has adopted excellent corporate responsibility and to being socially responsible through three integral principles viz., Insight, Inspiration and Involvement along with shaping the business of today and tomorrow. The company’s indigenously developed technology enables everything from primary treatment to removal of nutrients in sewage water to advancements in renewable energy sources. Our never-ending exploration of nature’s potential in its contribution towards corrective measures which takes by itself is an indication of what is possible when nature and technology join hands in ever growing biotechnology field. Decolourization of Distillery Waste Water. Detoxification and decolourization of industrial wastewater and distillery effluent is acquiring its importance in terms of environmental and aesthetic point of view. The characteristic of dark brown appearance of distillery wastewater is mainly due to the high molecular weight organic compounds called melanoidin. 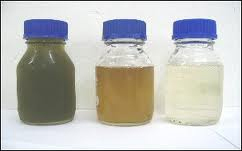 Studies dealing with pure culture of bacteria, fungi, and yeast and their oxidative enzymes (peroxidase, laccase) in decolourization of industrial wastewater to develop a better understanding of the phenomenon of microbial decolourization.